A long way from home, just over 450 kilometres, and I was so pleased I could still post a prompt yesterday. The trip was unexpected; Rod is a truck driver but does most of his work in and around Melbourne. On Monday the company he works for had an urgent interstate delivery, so Rod loaded up, called in home to pick me up and we arrived at Wagga Wagga at 1am. We slept, or should I say tried to sleep, in the truck beside the truck stop along with a dozen or so other trucks. Unfortunately, being on a highway, the traffic was constant and despite being very tired we only managed a few short naps before heading across to the restaurant (and bathroom facilities) at 6am. After breakfast, Rod drove a few kilometres up the road to deliver the load and I stayed at the truck stop. The ladies who work there were wonderful, kindly telling me to make myself extra mugs of tea or coffee and allowing me to wait at the table where I could plug in my computer and post my daily photo. The delivery took longer than expected and I ended up waiting for 3 1/2 hours. 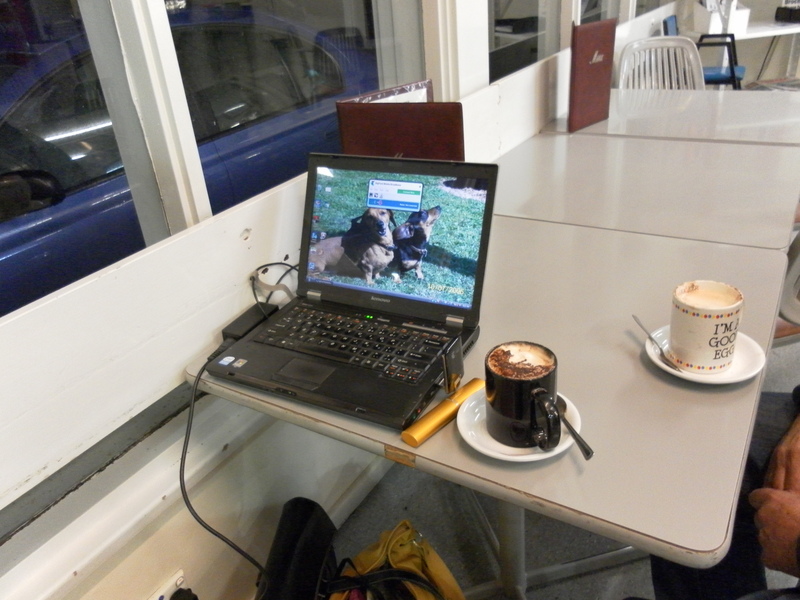 Lucky I had my computer and I was able to do quite a bit of work while people watching and gathering ideas 🙂 I actually wrote a story about an outback truck stop a few years ago and was thrilled when it won First Prize in the Joseph Furphy Memorial Competition. This stop was quite similar to the one in my story and I thoroughly enjoyed waiting there. We headed for home late morning after a walk around the Wagga Wagga Botanical Gardens. I’d been a few years back and loved it, so it was great to be able to show Rod. We arrived home at 7pm last night, tired but pleased with our little adventure. A change is as good as a holiday 🙂 Well…almost! Love the WW Botanic Gardens. We often stop there for a cuppa (our thermos is an essential travelling item) on our way to or from Sydney to play with the grandchildren.